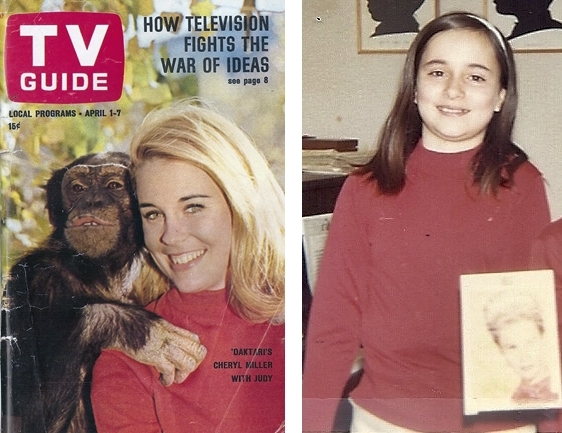 I collected pictures of Cheryl Miller (Paula Tracy), amassing a collection of 227 pictures (I had over 100 of my own and inherited the collections of 2 of my friends), along with numerous articles from movie and TV magazines of the day. I was ten when Daktari first aired and wanted to be Paula, spending my days outdoors with animals, especially the big cats. I requested an allowance so I could send away to a company called Stephen Sally (which remarkably still exists!) for glossy photos of my fav. Looking for that familiar large brown envelope in our mailbox each week was a real thrill. I had my pictures plastered all over the walls of my bedroom. Eventually my parents gave me a large pink scrapbook (undoubtedly so I would clean off the walls!) and I kept my collection there for years, even into adulthood. I was very proud of that collection. I thought I had lost that scrapbook but recently found it in our basement! I was over-the-moon happy about the find and am eager to share it now with you! I have many duplicates (all in fairly good condition) of some of the glossy photos. Over the summer we’ll devise some contests so you can enter to win these photos! Stay tuned.